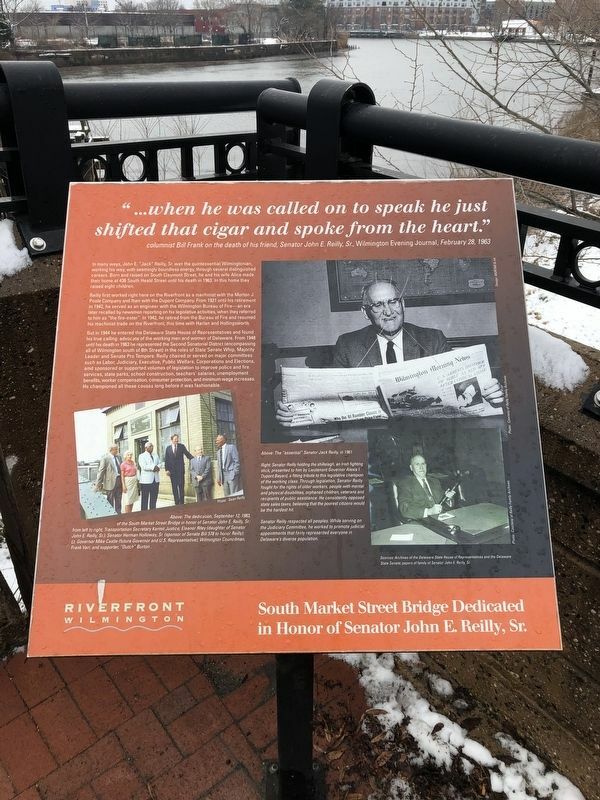 South Market Street Bridge Dedicated in Honor of Senator John E. Reilly, Sr.
"...when he was called on to speak he just shifted that cigar and spoke from the heart." In many ways, John E. "Jack" Reilly, Sr. was the quintessential Wilmingtonian, working his way, with seemingly boundless energy, through several distinguished careers. Born and raised on South Claymont Street, he and his wife Alice made their home at 436 South Heald Street until his death in 1963. In this home they raised eight children. Reilly first worked right here on the Riverfront as a machinist with the Morton J. Poole Company and then with the Dupont Company. From 1921 until his retirement in 1942, he served as an engineer with the Wilmington Bureau of Fire—an era later recalled by newsmen reporting on his legislative activities, when they referred to him as "the fire-eater". In 1942, he retired from the Bureau of Fire and resumed his machinist trade on the Riverfront, this time with Harlan and Hollingsworth. and found his true calling: advocate of the working men and women of Delaware. From 1948 until his death in 1963 he represented the Second Senatorial District (encompassing all of Wilmington south of 8th Street) in the roles of State Senate Whip, Majority Leader and Senate Pro Tempore. Reilly chaired or served on major committees such as Labor, Judiciary, Executive, Public Welfare, Corporations and Elections, and sponsored or supported volumes of legislation to improve police and fire services, state parks, school construction, teachers' salaries, unemployment benefits, worker compensation, consumer protection, and minimum wage increases. He championed all these causes long before it was fashionable. Above: This dedication, September 12, 1983, of the South Market Street Bridge in honor of Senator John E. Reilly, Sr.: from the left to the right, Transportation Secretary Kermit Justice; Eleanor Riley (daughter of Senator John E. Reilly, Sr.); Senator Herman Holloway, Sr. (sponsor of Senate Bill 578 to honor Reilly); Lt. Governor Mike Castle (future Governor and U.S. Representative); Wilmington Councilman, Frank Vari; and supporter, "Dutch" Burton. Above: The "essential" Senator Jack Reilly, in 1961. Right: Senator Reilly holding the shillelagh, an Irish fighting stick, presented to him by Lieutenant Governor Alexis I. Dupont Bayard, a fiting tribute to this legislative champion of the working class. Through legislation, Senator Reilly fought for the rights of older workers, people with mental and physical disabilities, orphaned children, veterans and recipients of public assistance. He consistently opposed state sales taxes, believing that the poorest citizens would be the hardest hit. Senator Reilly respected all peoples. While serving on the Judiciary Committee, he worked to promote judicial appointments that fairly represented everyone in Delaware's diverse population. Location. 39° 44.21′ N, 75° 33.232′ W. Marker is in Wilmington, Delaware, in New Castle County. Marker is on South Market Street (Business U.S. 13) south of South Shipley Street, on the right when traveling south. Touch for map. Marker is at or near this postal address: 99 South Market Street, Wilmington DE 19801, United States of America. Touch for directions. Other nearby markers. At least 8 other markers are within walking distance of this marker. Freedom Lost (within shouting distance of this marker); South Market Street Bridge (within shouting distance of this marker); The Underground Railroad (within shouting distance of this marker); The Great Railroad Boom (within shouting distance of this marker); Harriet Tubman (about 300 feet away, measured in a direct line); The Big Quarterly (about 300 feet away); a different marker also named The Great Railroad Boom (about 300 feet away); a different marker also named The Great Railroad Boom (about 600 feet away). Touch for a list and map of all markers in Wilmington. More. 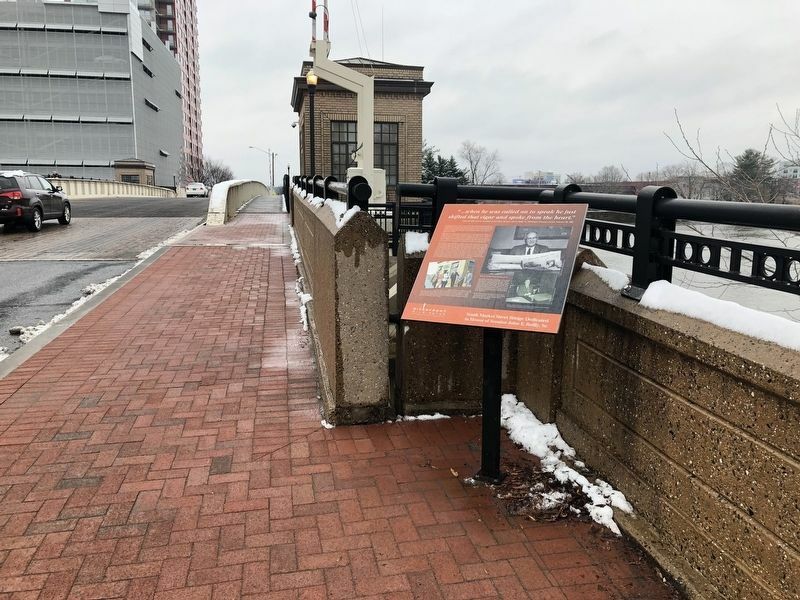 Search the internet for South Market Street Bridge Dedicated in Honor of Senator John E. Reilly, Sr.. Credits. This page was last revised on March 4, 2019. This page originally submitted on March 2, 2019, by Devry Becker Jones of Washington, District of Columbia. This page has been viewed 25 times since then. Photos: 1, 2. submitted on March 2, 2019, by Devry Becker Jones of Washington, District of Columbia. • Bill Pfingsten was the editor who published this page.